Super Mario World 2 is much less a sequel than an entirely new style of platformer worthy of its own moniker. Yoshi’s Island is the game’s true name something the title screen of the game makes us fully aware. 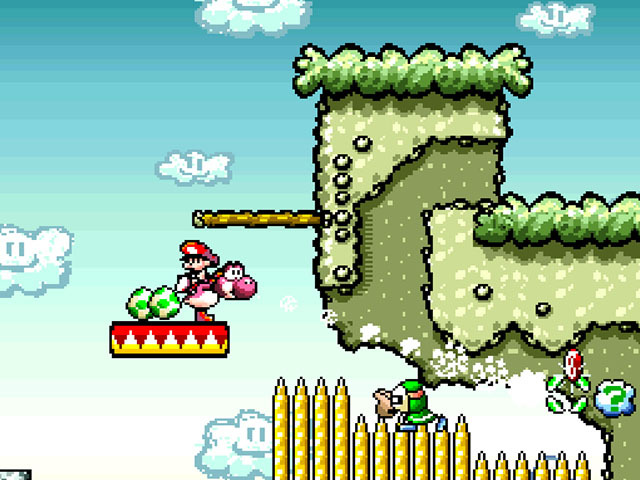 The game is essentially a prequel to the Super Mario series; a little Baby Mario winds up under the protection of a group of Yoshi, who take up the task of reuniting him with his kidnapped brother Luigi. Kamek the Magikoopa takes centre stage as the main antagonist who has attempted to capture the brothers before they can grow up and become a problem for Koopa kind in future. Of course we all know how that works out but for now it’s up to Yoshi to save the day. And while certain enemies, items and music queues are taken directly from the Super Mario series, everything in this game is rounded off in a much different way, a very Yoshi way in fact. Yoshi has a lot more natural manoeuvrability than Mario has and much more to protect itself. It can flutter jump to remain airborne a couple of seconds longer which can really help gain some horizontal distance as well as slow Yoshi’s descent to the ground, a Ground Pound attack, and returning from Super Mario World, it can gobble up enemies and trap them inside eggs. What differs this time though is that Yoshi can create a line of eggs to throw as artillery against various enemies as well as several to solve numerous puzzles along the way. These mechanics compliment the game’s more explorative approach over the typical Mario affair, as stages are much larger and time limits no longer restrict how long we can explore them. With three types of collectibles to be found in each stage and a points system from 0 – 100 to score us on, there’s certainly reason to explore every level from head to toe. Yeah he’s cute guys but shouldn’t you be worried about the swarm of Toadies on their way? Or continue being cute yourselves… whatever works. The mechanic that really sets Yoshi’s Island apart however title is the countdown based health system. 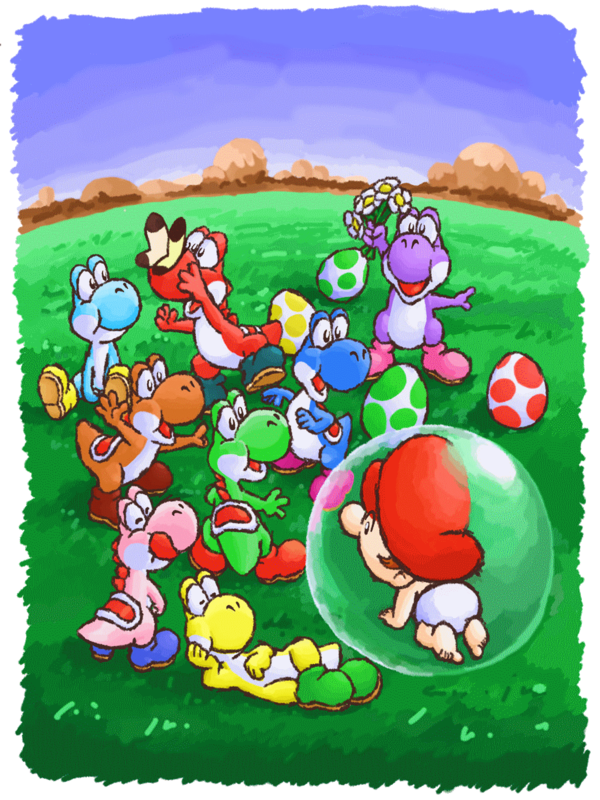 Essentially Yoshi is fairly indestructible (no surprise after all the abuse it received in Super Mario World) but each hit will knock Baby Mario off his back where the baby will take protection inside a bubble. This is where the countdown begins and if Yoshi cannot reach Baby Mario before the countdown ends, Kamek’s Toadies will sweep in and steal him away, losing the player a life. This aspect really helps Yoshi stand out from almost all of his platforming predecessors as the often mad dash to rescue the Baby leads to some tense platforming situations, tempting a leap of faith to try and grab the Baby in time. It also helps keep exploration a key feature of the title, in that we aren’t losing lives and being sent back to the last checkpoint every time we make contact with an enemy. Simply put, there’s much to do and see in each level of Yoshi’s Island and this countdown system stops us from being chucked out of the stage quite as often as say we would with Yoshi’s contemporaries. Isn’t he a cutie flying around like a Helicopter. Yoshi are just full of surprises! In fact Yoshi’s Island in general stands out among the throngs of Nintendo platformers to this day; the game is a masterpiece and one of the best examples of its genre of all time. While it may not encourage as much intuitive thinking as Super Mario World, the game continues to surprise us from start to finish. 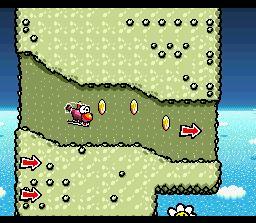 The power-ups are numerous and varied including fire and ice breath, bizarre vehicle transformations (that’s right Yoshi can transform into various vehicles such as a helicopter, a train, a digger, a submarine and a car) and even grabbing a watermelon to use the pips as ammunition. The storybook aesthetic is delightful, and the overall humour of the title is spot on, and the boss battles too deserve much praise, which require a good mix of offensive and defensive tactics to overcome. The final boss in particular is a tense and exciting affair and it’s nice to play a game that still gets the adrenaline pumping on the final challenge. Indeed as far as the Yoshi series is concerned, things don’t get better than this; Yoshi’s Island stands proudly beside several Mario titles as one of the greatest Nintendo platformers of all time. Raphael Raven in particular is a boss battle that surprises us. 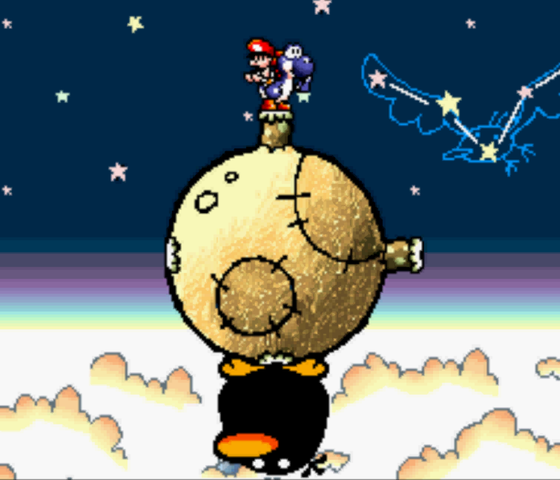 Takes us to Super Mario Galaxy 12 years before its time. This version also gives Yoshi a voice over the sound effects of the original. Not that Yoshi have much to say and all. The version I played however was the Wii U Virtual Console release of the Game Boy Advance remake from 2002. The original SNES version has not seen such a re-release and this is largely due to the Super FX2 chip that powered the game. Like the original Star Fox the game isn’t available in its original form most likely due to licensing issues and thus its re-release/remake has been added to the Virtual Console library in its stead. Aside from a few superficial differences however, the SNES version is largely intact. A total of 6 new levels were added, unlocked upon completion of the game to accompany the extra levels from the original and a couple of the standard levels are modified slightly, but overall the game remains the same as it always had been. Super Mario World 2: Yoshi’s Island is a great platformer and has been an absolute delight to play through the past couple of weeks. 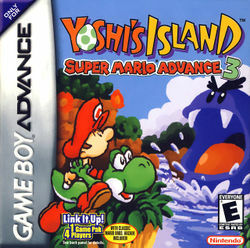 The game acts as a great beginning for the Yoshi series even if later entries haven’t quite met the standard set out in the original. 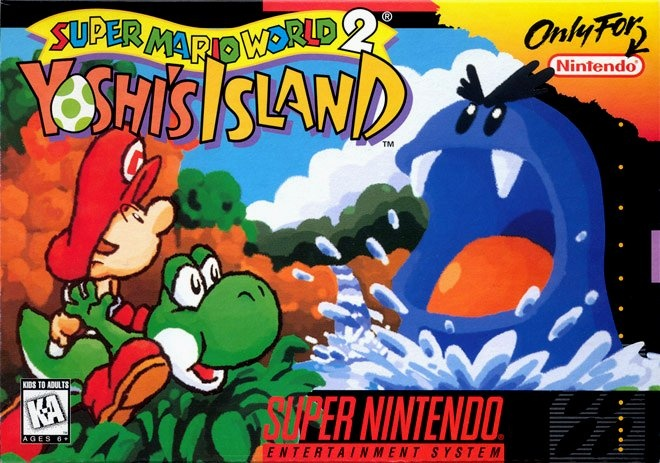 Whether you’ll enjoy it more than its SNES partner Super Mario World however will depend on what you like to get from your platformers, but it’s hard to deny, Yoshi’s Island really shines and the game is truly deserving of its title as one of the best Nintendo platformers of all-time.